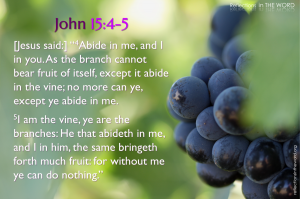 The teaching of Jesus in John 15 about the vine and the branches is sometimes used by Calvinists to support the idea of total inability, especially when Jesus talks about how without Him, people can do nothing. Calvinists focus on the statements in these verses that a “branch cannot bear fruit of itself” and that without Jesus “you can do nothing” and claim that these statement prove that people cannot do anything on their own, including believe in Jesus for eternal life. [Jesus] used the illustration of a grapevine and its branches. In speaking of the inability to do good works, He said: “Just as the branch is not able by itself to bear fruit—unless it abides in the vine—so neither can you unless you abide in me. … Apart from me you can do nothing” (John 15:4-5). That’s total inability (Palmer, Five Points, 14-15). So how can we understand John 15:4-5? First of all, it is important to note that this chapter is part of the “Upper Room Discourse” of John 13–15. It takes place in the upper room of a house in Jerusalem where Jesus and His disciples shared their last supper together, which was a Passover meal. After the meal, Jesus washed the feet of His disciples (John 13:1-17) and then proceeded to give them some final words of instruction and encouragement. So when Jesus spoke the words which are recorded in John 15:4-5, Jesus was not speaking to people who did not have eternal life, but to those who did. That is, He was speaking to His disciples, to those who were already regenerate. Among many other things He told His disciples during the Upper Room Discourse, John 15:1-8 is about how the disciples can be productive and fruitful as followers of Jesus. He basically tells His disciples that they must not try to engage in ministry on their own strength, but must abide and remain in Him. They must stay attached to Jesus. They must look to Him for guidance, wisdom, and strength. If they try to work in the world under their own power, they will not get very far. They will accomplish nothing. The illustration Jesus uses for this lesson is the vine and the branches. 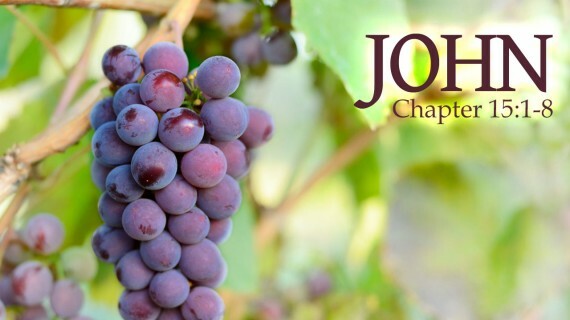 Just as a branch cannot bear any fruit unless it remains attached to the vine, so also, the disciples of Jesus will not be able to accomplish anything for the kingdom of God unless they remain connected to Jesus by looking to Him for guidance and direction. So when John 14:4-5 is studied in context, it quickly becomes obvious that these verses have absolutely nothing to do with the inability of unbelievers to do anything. Jesus isn’t talking about unbelievers at all! Instead, Jesus is talking to believers, and specifically to His disciples, telling them (and all future disciples as well) that if we want to minister faithfully within the kingdom of God as followers of Jesus, they must abide in Jesus. That is, they must look to Him for guidance, seek to follow His example, learn to listen to His voice for wisdom, and depend upon Him for strength. John 15:4-5 is talking about total inability, but not the total inability of unbelievers. Instead, Jesus is teaching about the total inability of disciples to do anything in the Kingdom of God by their own strength and resources. Jeremy, I believe that “airo” in John 15:2 should not be translated as “cut off” as in the NIV. Instead “lift up” or “raise up”. I completely agree. I will probably discuss this when I get to the discussion of perseverance of the saints. The KJV there is a poor translation — or at least, easily misunderstood. Anyway, there is a slight difference between regeneration, indwelling, baptism, and sealing of the Spirit. Today, all believers receive all 4 works of the Spirit the moment they believe in Jesus. In Old Testament times, all saints were regenerated. Some were indwelled for certain purposes and tasks. I agree with you Jeremy. In reading this I was reminded of the tale of a lady in one church who seemingly always started her prayers with, “Lord, I am just a poor worm before you…” This is the kind of attitude these total inability and depravity teachings create, instead of love, joy and peace in the Holy Spirit. Yes. That is such a tragic application of this theology. God wants us to see ourselves as His royal children, full of infinite value and worth. I had a man in my church once who taught his children from the earliest days that they were “sinner black spots” before God. This is what he called them, and how he introduced them to me. “This is sinner-black-spot number 1. This is sinner-black-spot number 2.” Yikes!